Still further away and still more mysterious than the Isla del Cano is the Pacific Isla del Coco, 500 kilometers southwest of Costa Rica. 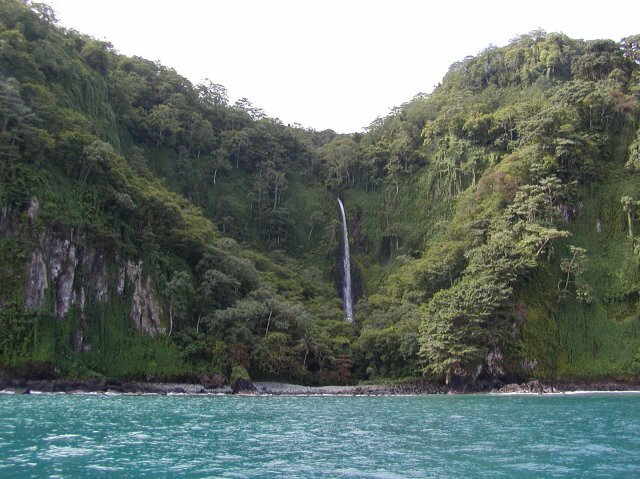 Also called “Treasure Island,” Isla del Coco (“Coconut Island”) has an area of 52 square kilometers (circa 12 x 5 kilometers) and is the world’s second-largest uninhabited island and a Costa Rican national park. The island is the northernmost link of a chain of volcanoes, most of which are under the surface of the sea. They stretch across the Equator all the way to the Galapagos Islands. The Isla del Coco is long and narrow and has a hilly surface. The Cerro Iglesias (634 meters) is its highest point. Steep cliffs up to 100-meters-high rise from the sea and make access to the island difficult. Waterfalls, which pour off the cliffs directly onto the shore or into the sea, lend the island its particular charm. Because of its isolation, Coconut Island has developed a unique natural environment which attracts naturalists who visit it to study its animal and plant life. There are no land animals native to the island with the exception of two types of lizard, while there are 80 species of birds found here. Three of them are endemic, a cuckoo, a finch and a variety of flycatcher. At the same time, more than 70 different types of plants are endemic to the island, making it even more fascinating to botanists. The majestic frigate bird nests on the island. Boobies, shearwaters and gulls feed on the plentiful supply of fish in the sea around it. The more than 5,000 wild pigs, descendants of domesticated animals set free on the island by sailors in the 18th century, are less attractive to naturalists. Everywhere there are signs of mudwallowing orgies and uprooted plants, which the pigs leave behind along with a depressing trail of destruction. When multiplied by the number of grunting wild pigs on the island, the damage is considerable and produces erosion which subsequently also harms the coral reef. The pigs, which were probably regarded as a delicacy by stranded pirates and treasure seekers, have other imported animals to keep them company. Goats, rats and cats also live on Isla del Coco. Divers regard the sea around Isla del Coco as the world’s best diving ground. Sharks, however, cast a shadow on this underwater paradise. Galapagos sharks, white spotted sharks and hammerhead sharks have been sighted feeding on the plentiful supply of fish that fills the sea around the island. Divers claim that the sharks prefer juicy fresh fish to tough humans packed in neoprene suits, but they keep a respectful eye on the toothy giants nonetheless. Rays, pilot whales, flying fish and dolphins also populate the colorful underwater world. But even on Coconut Island paradise is not perfect. The fish population is being thinned by illegal catches of lobster and tuna (within a five-kilometer protected perimeter). The Costa Rican national park police who are responsible for patrolling the island and sea around it are too few and far between to effectively stop such poaching. Visits to the Isla del Coco are only possible by taking a cruise ship journey lasting several days.